Superabundant Atmosphere, an installation by Jacob Hashimoto includes thousands of shimmering white “kites,” each handmade from silk glued over a tied bamboo frame. 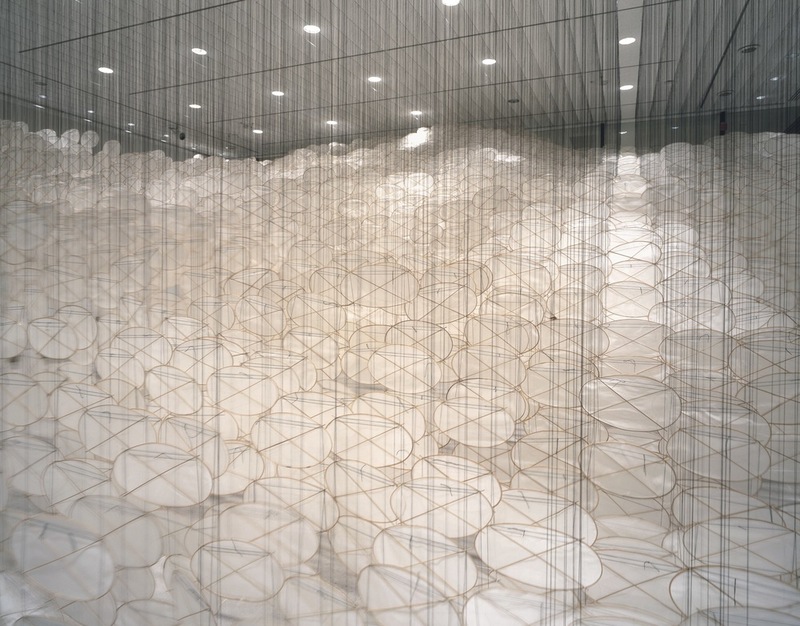 During the installation process, Hashimoto and five assistants will string the kites together and suspend them from the gallery ceiling, creating an enormous sculptural cloud rising upward and outward from the rear of the gallery. 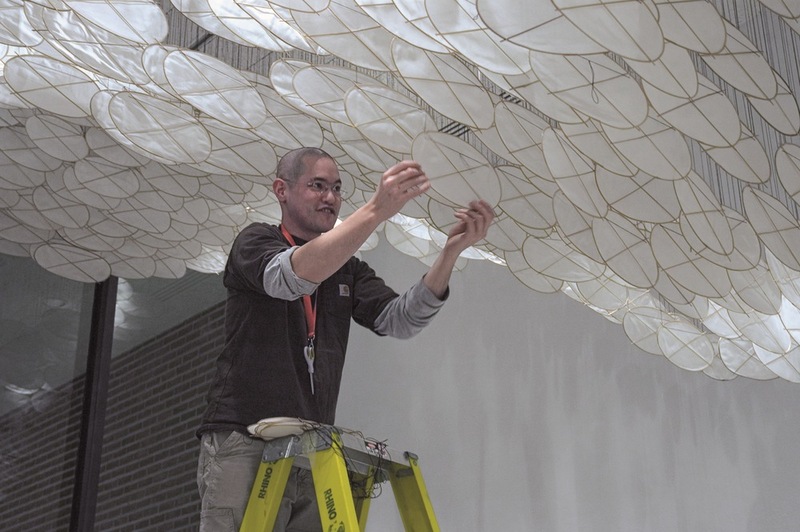 Although Hashimoto makes use of traditional kite-making materials and techniques, the small kites that form his installations do not actually fly. Instead, they are the modular units that he multiplies and arranges into structures that, while monumental in scale, appear to be weightless. As the light that streams through the gallery’s front window changes throughout the day, so too, will the appearance of Superabundant Atmosphere. 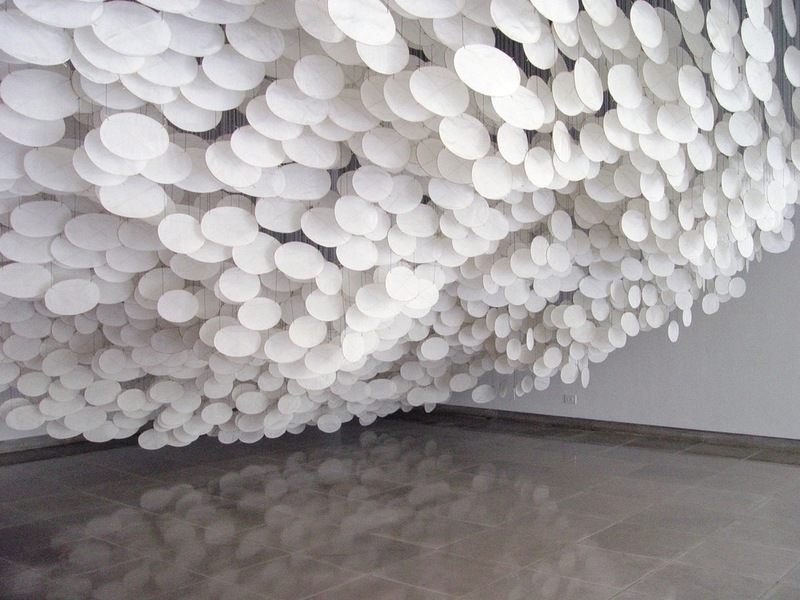 Sometimes the installation will seem buoyant and ethereal, while at other times it will appear to be a solid mass. In any guise, Hashimoto intends for Superabundant Atmosphere to convey a sense of wonder and playfulness, as visitors encounter, walk around, and react to its presence. 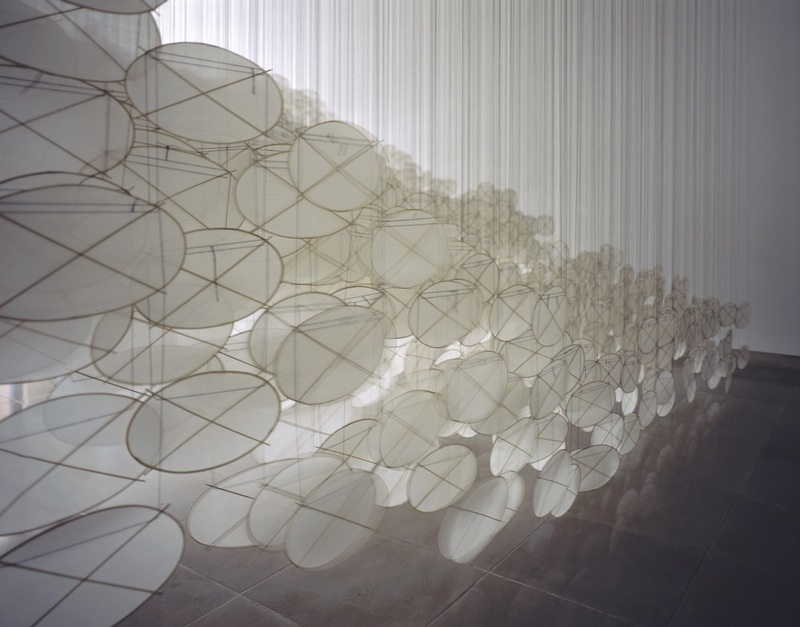 Superabundant Atmosphere is characterized by repetitive handwork - tying, knotting, and gluing, yet often Hashimoto uses technology-based processes to make exceptionally precise objects. In each medium the artist reveals his ongoing concerns with nature and its orderly quality. In Untitled - Bologna, 2003, thousands of clustered paper kites not only evoke stately columns, but also twists of DNA strands or trailing squid tentacles. Positive/Negative, 2003, a computer-designed series of shiny, black-and white enameled foam cubes, suggests bubbling foam on water. Jacob Hashimoto was born in 1973 in Greeley, Colorado. In 1996 he received his BFA from the School of the Art Institute of Chicago. Hashimoto’s recent solo exhibitions include The Nature of Objects (2003), Studio la Città, Verona, Italy; Silent Rhythm(2002), Galleria Traghetto, Venice, Italy; and Big Mountain andGiant Yellow (2001), Patricia Faure Gallery, Santa Monica, California. Los Angeles County Museum of Art’s LACMALab commissioned Water-Table, (2001), a large-scale installation, forMade in California NOW. Jacob Hashimoto divides his time between Brooklyn, New York and Verona, Italy.